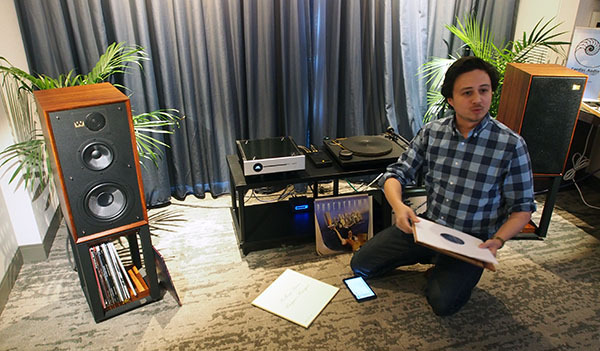 MoFi Distribution’s Jonathan Derda was demming the Wharfedale Linton, 3-way stand-mounted speakers ($1498/pair with stands) using a neat little Quad Artera Solus integrated amplifier ($1999), both products making their US debuts at AXPONA. He played me “Sympathy for the Devil” from the MoFi reissue of the Stones’ Beggars Banquet album on a MoFi StudioDeck+U player ($1499 with MoFi UltraTracker MM cartridge) and a Tim de Paravicini-designed MoFi StudioPhono preamp ($299) and this relatively in expensive system had this old geezer rocking. And then Jonathan blew my mind. LP player and amplifier were sitting on Solidsteel 2-shelf stands from Italy ($699), supported by Finite Element Ceraballs ($299/4), which use a stainless steel housing terminated with a hard ceramic ball. When Jonathan played a track called “Cinders & Smoke” with Roon, feeding the Quad’s USB input, and took away the three Ceraballs from under the Quad amplifier, the system sounded flat and lifeless. When he put them back, back came the magic. Crazy, right? But I heard what I heard!